Public safety professionals agree that enhancing existing campus safety and security infrastructures are among the top priorities at colleges across the country. Technology migration compatibility, budget constraints, and deployment challenges are some of the hurdles that must be overcome to secure a safer campus. 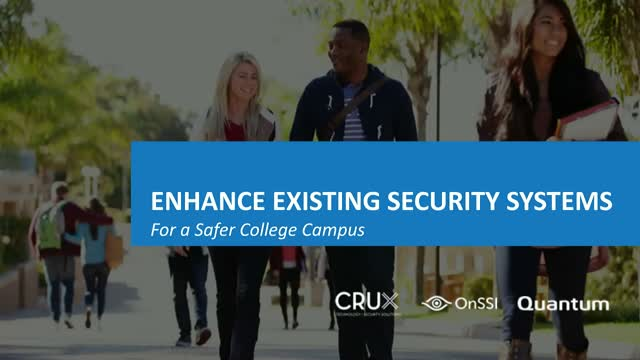 Join Crux Solutions, OnSSI, and Quantum for a webinar that explores how educational institutions are finding ways to enhance their existing security and surveillance infrastructure, incorporate a workable migration solution that is cost effective, easy to deploy, and easy to use. Drew Deatherage is an innovative leader in the telecommunications and security fields, as well as a trusted and proven partner. For more than 25 years, he has helped clients design systems that address key operational priorities while enhancing the learning experience and work environment. His expertise includes the design of network infrastructure, electronic security, physical security systems and life safety codes. Dan Berg assists integrators and end users with system design, hardware recommendations, product demonstrations, and RFP responses. Dan is also responsible for the creation of technical documentation and working with the development team to implement product improvements and feature requests from customers. Dan has over 20 years of experience working with manufacturers, integrators and end users. Russ Wellmon is the Eastern Regional Manager focused on assisting customers with their video surveillance storage requirements while meeting budget goals. Russ has 35 years’ experience in the security integration business. Holding positions in sales at security integration companies and manufactures. He continues to assist customs with large-scale complex integration projects.